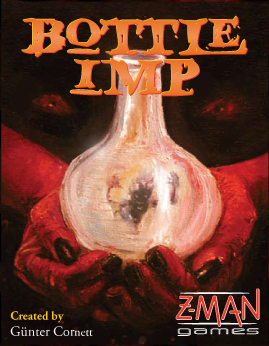 As with many other trick-taking card games, the idea of The Bottle Imp is to acquire the most points. The Bottle Imp makes trumps out of the lowest cards. The player with the highest card less than the price of the Bottle earns the trick and also the bottle imp card. Then the price of the Bottle falls to that of the winning card. In this way the owner of the Bottle Imp changes until its value can no longer be undercut. Whoever has the Bottle Imp at the end of the hand earns negative points instead of positive ones. Brilliant..takes a very simple trick-taking system and perfectly encapsulates the story of a man with a powerful wish-granting bottle that has terrible consequences if you can't be rid of it before you die...but the only way to be rid of it is to sell it for less than you bought it for. While you have the bottle, you'll be taking tricks with ease (your every wish being granted...) but can you get rid of it before time runs out? Fun, fun game, and a rare trick-taking game that I enjoy with just three. Bottle Imp is an amazingly fun trick taking game with a twist. It reminds me of "No Thanks! ", which also has simple rules and where the main focus of the game is to bluff the other players. This is a must buy for fans of clever innovate trick-taking games.